Miracle weight loss wonders and fat blockers? Here is the official list to check weight loss claims that seem to good to be true! You saw me write about the Senate cracking down on weight loss fads and bogus supplements in connection with the committee hearing of Dr. Mehmet Oz. That made loads of waves, but it’s only part of a major FTC crackdown on misleading weight loss advertisements. The entire effort the FTC aptly (and with a dry sense of humor you don’t expect of bureaucrats) called “Operation Failed Resolution.” It was also responsible for their investigating Sensa, Inc. and telling them they have to “stop being frauds” or else. The FTC has a very good and detailed explanation of each over on their website. Have a look, it’s worth it. 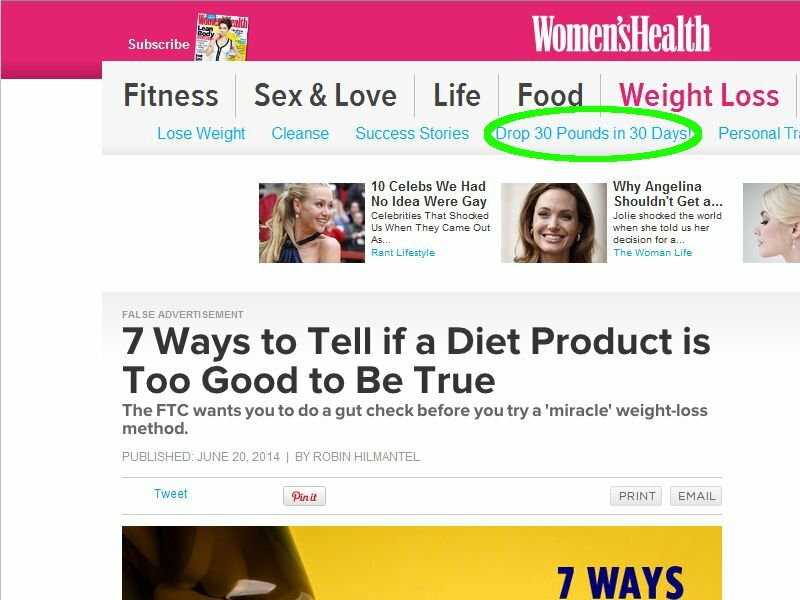 Every time a con artist is able to place an ad for a bogus weight loss product on a television or radio station, in a newspaper or magazine, or on a legitimate website, it undermines the credibility of advertising and does incalculable damage to the reputation for accuracy that broadcasters and publishers work hard to earn. Of course, it all boils down to the same message: If a diet product seems too good to be true, it probably is. The best way to drop pounds is to make sustainable lifestyle changes that will also make you healthier overall. The Women’s Health website reporting the FTC’s list. That link takes you to this website. Picture courtesy of Petr Kratchovil. Yeah, I like that! These products need to be stopped before they are advertised! Unfortunately yes, more often than not that’s the case. I can only hope that if enough pressure builds up then those companies will have to rethink their ways.